WICKHAM'S CAY II, Tortola, VI- Normally on the scene to attend to victims of accidents, an ambulance became involved in a collision moments ago, April 4, 2015 when another vehicle slammed into it on the dual carriageway of the Sir Walter Francis Drive. 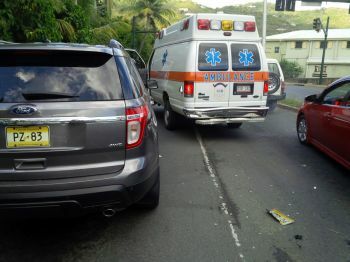 According to our Team of Reporters on the scene, the ambulance was hit from behind by a vehicle on the eastbound carriageway in the vicinity of the traffic lights at Wickham's Cay II. 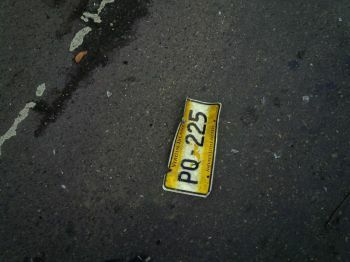 The vehicle that hit the ambulance reportedly sped away, leaving a number plate (PQ 225) behind and some amount of debris. It is not clear if anyone was injured. Virgin Islands News Online will bring you more details as they come in. Wow.. really get some mad people out there. Vino does you ever sleep??? If indeed that was the licence plate that was left behind, as the saying goes, "God don't (sic) like ugly". This very reckless the BVI to slack with their laws people who commit a punishable should be send back to their country residents should be punish to the fullest the time has come for the legislatures to get serious the Island is out of hand . Where does it say that the perpetrator came from somewhere else? Beside the fact that I had to put in the punctuation to make sense of your comment,where in this article was there any mention of the dumb on the run being a foreigner????? This person needs to be in the Guiness Book of Records as 'Worlds Dumbest Driver'. Driver 225 had just purchased a roti and wanted to get home before it got cold. Some people for,y like cold food . The fool will read VINO and then call police to report that his vehicle was stolen. These drivers have no patience that's why we have so many accidents. They always quick to overtake. They have no consideration for pedestrians. Many times traffic stop because a big truck slowly making a turn and blocking a lane or an accident ahead then some jack@$$ just pullup and trying to overtake all of the other rides only to further block up traffic. I don’t see anyone on here voicing their concerns for occupants of the ambulance. These men and women who put their lives on the line every day to help us when we are in our greatest hour of need, but who cares about what happened to them? Come on VINO and BVI public show some compassion or at least pretend you care a little. Thanks to this man my friend is home now with injuries to his neck and back so what now?? Good point. That is very unfortunate; BOTH for the individual AND for the ambulance service which I understand was already stretched thin.